Hey everyone, we are on our Lake Michigan Circle Tour, but I have a real treat for you. I love sweet Kay from The Kay Times, and I am so excited she is guest posting for me today! Take it away, lady! Hi guys I'm Kay and I blog over at The Kay Times. I'm stoked that Olya let me take over her blog today. One of the things I love about Olya is her cultural background, being born in Siberia and living in the U.S. I love hearing about the unique things from different cultures. 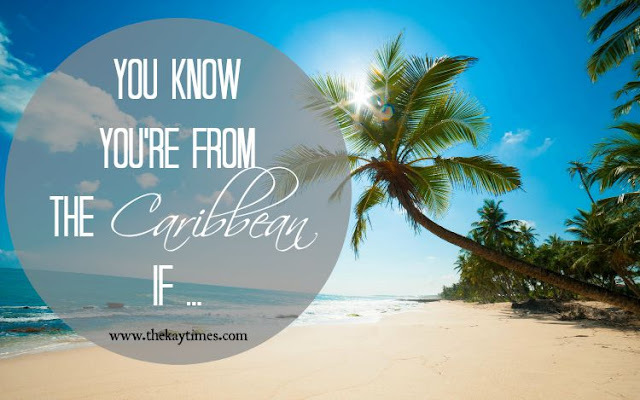 I myself am not from the U.S. (in case that wasn't fairly obvious) and there are many eccentric (and frankly comically weird) things about people who grew up in the Caribbean. You can spot us a mile away I tell ya! ... You think anything Under 30 degrees Celsius (70's F) is freezing! ... 36 - 40 degrees (90's to 100) is legit unbearable and RARELY ever happens (if ever). ... You wash 'wares', you don't 'do the dishes'. ... As a kid, you knew better than to talk back to your parents because Caribbean parents don't play. ... You know that just because the sun is up in the morning, it doesn't mean that it won't be a rainy day by noon. ... You went to Secondary School, not High School and each class was called a Form and not a Grade (unless you went to an International School in which case - disregard). ... No one ever leaves your house thirsty, hungry or empty handed. Food for all. ... You don't consider going to the 'beach' a vacation. It's called the weekend. If you're taking a vacation you're leaving the country. We're a weird and cool bunch I tell you! Thanks again to Olya for letting me take over her page while she's on vacay! Yay!!! People will legit think Caribbean folks are crazy after this but ... eh! Arent we all?! Thanks for letting me guest post! So much fun! I love hearing about other cultures, and what makes each of them unique! And even though I'm not from the Caribbean, I still think that anything below 70 is cold! Living in the South definitely makes for "difficult" winters. i'm not from the Caribbean but heck yes anything under 70 is freezing! I feel you girl ;) but I don't think 90-100 is unbearable, that is heaven! 100 is really ridiculous though. I just cant do 100! I'm peeing my pants here laughing at anything under 70 degrees is cold! haha. For me anything under 20 degrees is cold. Ketchup on pizza?! Love the rhyme, school is very important. It has been in the 90's here and that is too much! Love this post!! Makes me want to come visit you even more :) some similarities with Italian families here too. We consider it a personal failing if someone leaves hungry! Loved reading this and reminiscing of home! K knows what she's talking about. The culture and lingo is very unique to other countries! I'm so grateful to be born and raised in the Caribbean and the same country as K.
Haha. Such a great list. All those sayings that I grew up with. In Jamaica, chicken and chips was my all-time favorite thing to eat. Now in the U.S., it's called Chicken tenders and french fries. But it's still the same dish! With some ketchup and pepper sauce on the side. Yup! Great post as always, Kay! Love this! I am counting down the days till we are in the Caribbean again. We have secret dreams of moving there one day.